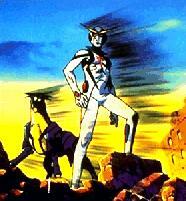 Streamline Pictures/Harmony Gold Tatsunoko Prod. The dark age of mankind is upon us. Machines have thrown off the yokes of their human masters and have become the rulers of the world. Leading the revolt is the leader of the robots, android BK-1, now known infamously as the Black King. The humans have been rounded up and herded into slave camps, now forced to serve the machines. They're abused and opressed, their spirits virtually crushed save for one last hope. They believe one will come to liberate them, one whose power is a match for the machines. They see him as their savior, the last, best hope of humankind. They have a name for him: Casshan.